Jessying - Malaysia Beauty Blog - Skin Care reviews, Make Up reviews and latest beauty news in town! 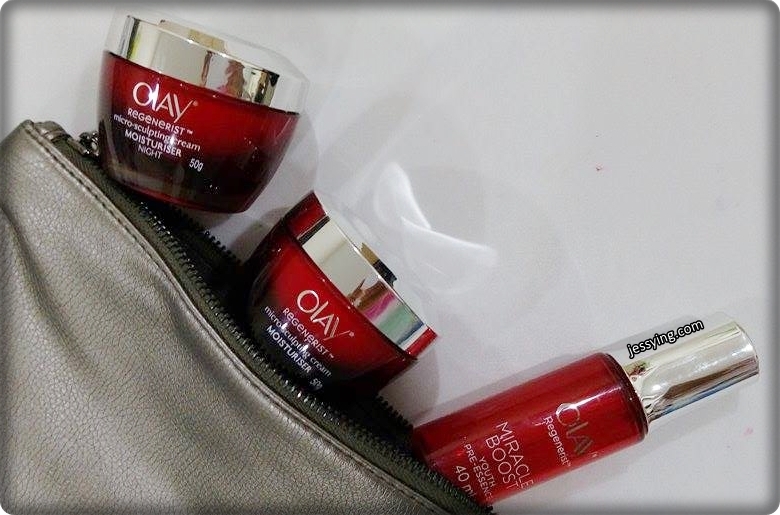 : Review of Olay Regenerist Miracle Duo range after 4 weeks! Review of Olay Regenerist Miracle Duo range after 4 weeks! It’s every women dream to look beautiful. Be it your dream V-shape face, big eyes, sharp nose, luscious lips or attractive hair, I’m sure all of us yearn to look younger than our age. Well perhaps that’s the reason they said a woman’s age is a secret. And often when someone compliment us that “Hey you look younger than your age, what’s your secret?”. Well you can’t help but show a beaming smile to the person and say “Awww.... thank you, I shall buy you a meal!” Sounds familiar? I’m not sure about you but I stand inches away from the mirror to closely examine my face every now and then. Deep inside I was asking myself, where does this pigmentation, dark spots or wrinkles come from? Well I have tried all my life to take care of my skin so that I don’t age too fast. After all, the first thing a person sees when they meet you is your face (i.e skin). I’m so thankful for the creator of makeup because it makes me looks beautiful. There is a lot of things that can be concealed under makeup... Dark spots, pigmentation, uneven skin tones, dark eye circles etc, but do you realise you can never hide your wrinkles or lines? And wrinkles are a tell-tale sign of aging. With the amount of pollution we face today, we are actually guilty of our skin’s aging process. We cannot stop the aging process but we can slow it down a little bit for sure. The natural aging process is called intrinsic aging, while the aging process caused by external factors is called extrinsic aging. Both show up visibly with the same results, but extrinsic aging is something we can fight against. We all know we cannot stop our skin from aging but we can slow down the process, at least to reduce the signs of aging with the right anti-aging skincare. The new Olay Regenerist skincare range promises to renew from within, plumping surface cells for a dramatic transformation without the need for fillers. In this Regenerist Miracle Duo range, there are a total of three products namely; Regenerist Miracle Boost Youth Pre-Essence, Regenerist Micro-Sculpting Day Cream and Regenerist Mirco-Sculpting Night Cream. Honestly I haven’t been using Olay products for the longest time, I think the last time I was using them was during high school because it’s fairly affordable and my mum was using it. 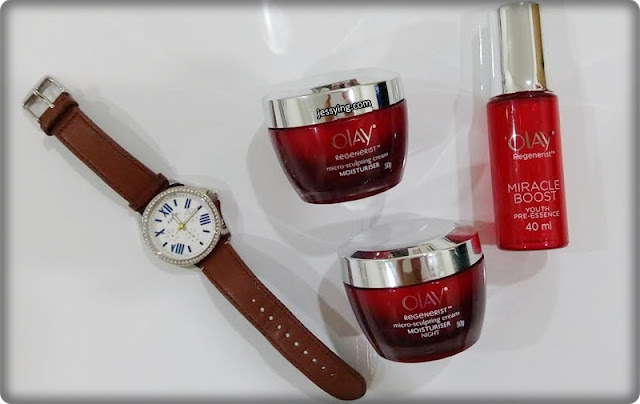 Over the years, Olay has improved their formulation and packaging and here I’m trying out this new Regenerist Miracle Duo range that an anti-aging skincare range that hydrates and renews to firm and lift, helping to retain skin’s youthful surface contours. In addition, they are fragrance free as well! Anyway, I have tried it for 4 weeks, so I’m going to share my thoughts here with you girls! Olay Regenerist Miracle Boost Youth Pre-Essence (RM79.90/40ml) is designed to boost the penetration of anti-aging actives of your moisturizer 2 times more to increase skin cell metabolism and renewal for stunning, youthful skin that looks up to 10 years younger. Niacinamide (Vitamin B3) : Boosts surface cell metabolism and renewal, Reduces wrinkles. Ingredient list : Water, Niacinamide, Glycerin, Butylene Glycol, Hexylene Glycol, Dimethicone, Acrylates/C10-30 Alkyl Acrylate Crosspolymer, PEG-32, Phenoxyethanol, Benzyl Alcohol, Sodium Hydroxide, Methylparaben, Dimethiconol, Disodium EDTA, Inositol, Isopropyl Isostearate, Sodium Metabisulfite, Tocopheryl Acetate, PEG-100 Stearate, Fragrance, Sodium Ascorbyl Phosphate, Morus Alba Root Extract, Glyceryl Acrylate/Acrylic Acid Copolymer, PVM/MA Copolymer, Sodium PEG-7 Olive Oil Carboxylate, Lilium Candidum Flower Extract, Palmitoyl Pentapeptide-4, Lonicera Japonica (Honeysuckle) Flower Extract. Its unique auto-dropper packaging ensures the exact and right amount of the pre-essence is delivered in every single application. For ideal results, apply two-pump dosage per use. Apply product twice a day after toner, and before serum and moisturiser. Just un-screw the cap to automatically draw product into the dropper. Press the pump button to dispense the pre-essence. The texture is gelish watery and easily absorbable. I did a skin moisture test with this alone and the result is amazing; my skin moisture jumps from 23.2% to 85.5%! I really like this product because my skin does not feel sticky, but instead very soft and supple. Although it looks creamy, but I assure you it is actually not the case. The texture is gelish and absorbs fairly fast into my dry skin once I massage it in. Using your fingertips, massage a small amount on the face and neck in an upward circular motion, focusing on areas like the brow and jaw line, which need more support (i.e lifting). My face feel amazing smooth and plump at this point. Even after spending several hours alternating between being outdoors and in an air conditioned room, my skin still feels moist without feeling sticky. 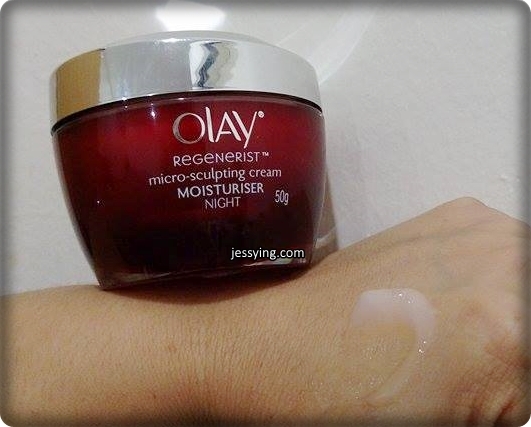 For night time, I used Olay Regenerist Mirco-Sculpting Night Cream (RM99.90/50g). It’s said to plump & firm skin, provide smooth & supple skin texture and enhance radiance. The cream is in transparent milky colour and texture is creamy gel-like. It’s a little heavier than the day cream. My skin feels soft, smooth and supple after applying this. As the texture is a little bit heavy, you do not have to apply a lot, yet my face feel so fresh and hydrated the next morning! More savings yay! So what I do every night is to have a mini pampering massage of few minutes for myself. I take a small portion from the jar and warm up using my palm before applying to my entire face. Stroke from your forehead, down your cheeks and over to your neck. After a few minutes of gentle stroking, I use gentle pressing method to enhance absorption of product more efficiently. And please don’t forget to do the same to your neck because it’s the first sign of aging that often people neglected. Massages like this help to improve blood circulation and lymph circulation, which can enhance the delivery of oxygen and nutrients to cells. This makes the cells healthier and more efficient. Remember do not use excessive pressure or pull on your skin, soft, gentle movements are sufficient! After using for 4 weeks of using Olay Regenerist Miracle Duo range, I’m pretty impressed with it. My skin looks more radiant, soft, plump and smooth and that’s the sign of healthy skin right? I think the healthier living lifestyle that I’m trying to adopt contributed to all this as well. I try to sleep earlier nowadays, have less oily & spicy food and have a mini walk to the lake nearby my house with my dog while playing Pokemon. Olay Regenerist Miracle Duo range new packaging is available in major pharmacies such as Watsons, Guardian and Caring starting October 2016.